A more intimate view of one of the cascades at Dunn's River Falls, which are composed of travertine, a form of limestone deposited by waters rich in calcium carbonate. Travertine is more typically associated with geothermal features like those in Yellowstone National Park, and the mineral is continuously deposited by the water as it flows over the existing rock. Perhaps this compensates for the erosion caused by thousands of tourists' hands and feet every year! 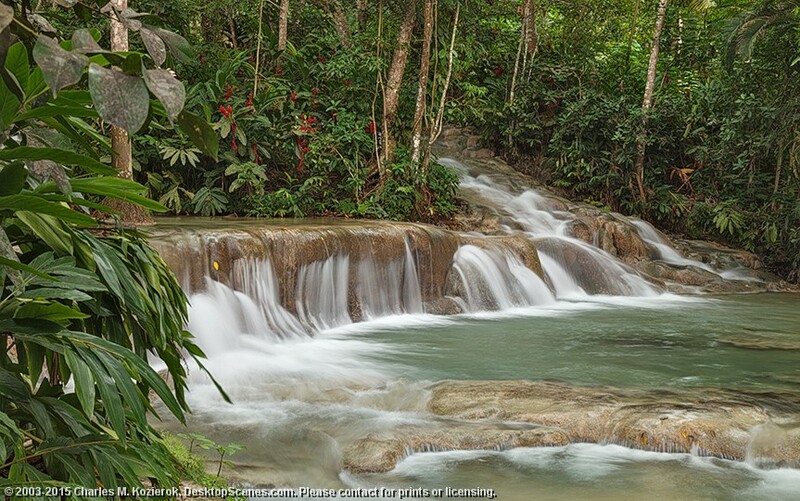 Dunn's River Falls is one of only a handful of known travertine falls that empty directly into the ocean.